With no experience, how did Niamh – a Community Camp participant and now member of The Big Lunch team – learn how to build traditional boats by hand, and set herself the challenge of building one to be used by her community? Here she tells us how she fought the fear and found the spark to make things happen. I grew up pretty much landlocked in South County Derry, Northern Ireland, but close to the River Bann. After university I went to America on my own, because it seemed like it might be an adventure. I ended up in Florida where I worked in marinas detailing boats. Then I lived in Alabama and Texas, and I was lonely and homesick for about 10 years; I never found any community there. I came home in 2009 after reconnecting with my university friends via Facebook and took every opportunity that came along to get involved with people and community activities. I got to know people on Rathlin Island and on one visit someone asked if I wanted to row to the Scottish island of Iona in the Colmcille, which is the largest currach* in the world. With no rowing experience at all, I of course said yes! But really, I had just been through a traumatic time personally, and I needed something cathartic to help me through. That’s how I try to do most things: don’t let fear stop you. Leap in at the deep end and learn along the way. * A currach is a traditional Irish boat, with a wooden frame over which layers of canvas and tar are spread to seal the boat. So off I went with this motley crew and we rowed across the Dalradian sea: all brave hearts and kindred spirits. We camped on beaches, fished and fed seals, bonded by telling bad jokes and singing, and thought about our lives. And we rowed and rowed and rowed. It was a very spiritual journey – a Camino by sea – but full of madcap adventures I haven’t even touched on here. We made it back triumphantly, and I think we all felt a bit transformed. I didn’t get my land legs back again for weeks. I wanted more and I wanted to give other people that experience. A few months later, I led the build on another boat, which we named Fionnuala, after one of the Children of Lir. We launched her in Rathlin, back where my journey with currachs started. Over the next few months I took friends and members of the community out on the Fionnuala on the River Lagan, which runs through Belfast City. Rowing on the river in a gorgeous wooden boat at dusk, when the water is like a mirror, was really special. People stopped and stared because it’s an unusual thing, and we got a brand new perspective on Belfast. There’s no politics on the river. No one community has ever claimed it. Then I decided, having built one boat, I could leap right into teaching others how to do it. So I built three primitive currachs at the Steiner school, with classes of 10 to 14 year olds (although I did the usual panicking first). Right after this I went to a Community Camp at the Eden Project, which spurred on the ‘Big Currach Build’, an idea conceived over a pub dinner with some Belfast folk. 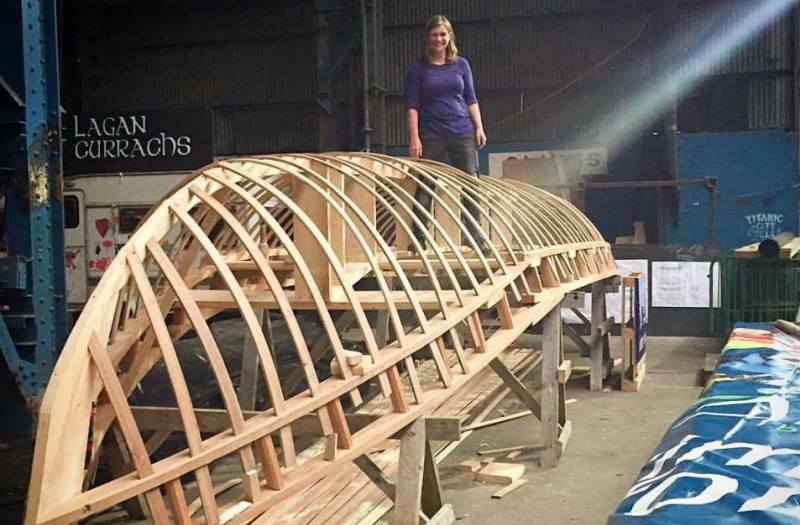 We wanted to go for a more ambitious, bigger, scarier project – a currach about the same size as the Colmcille. I talked to the Heritage Lottery Fund and managed to convince them I knew what I was doing, so we put in an application and they decided to fund it. Thus began seven months of sheer panic and heart palpitations; I wasn’t feeling that clever or brave. It was a huge undertaking; I work full time and I’m a lone parent. There were times when we despaired a bit. There was so much to organise and so much that could go wrong, and nearly all of it did. We worried that we wouldn’t get enough help, but we ended up with over 70 people helping at different stages of the build – including 12 Belfast based Community Camp participants – and we’ve had guidance from Lough Neagh Boats. The build has taken 55 days so far, because every little piece has to be painstakingly handmade, and everyone is learning about woodwork as they go. We’ve had some activities for families, building little toy currachs so kids can come and float them on launch day. This boat will be around for decades so these kids will grow up with it. We wanted them to be inspired by the project, and to build a relationship with the boat themselves. So now we are coming towards the end of the build journey and are about to start another: launching the currach with a floating lantern event. There will be people in the boat on the water soon, and we will be responsible for their safety. There will be only three layers of canvas between them and the big bad ocean, but we can’t start being intimidated and afraid to try now. Now, close to the end of the build, the nature of the fear is changing. You can only deal with fear in stages, in small chunks, and make yourself selectively blind to the rest until it’s time. But we know the boat is strong. We know it’s going to be safe. And we’ve come too far for fear to hold us back. You can only deal with fear in stages, in small chunks, and make yourself selectively blind to the rest until it’s time.